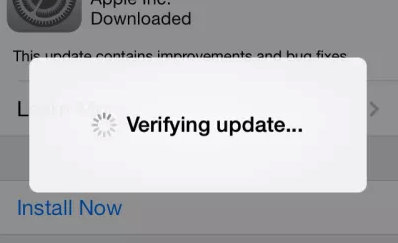 How to Fix iOS 10 Stuck on "Verifying Update"
Many users who are installing iOS updates (whether beta or final versions) encounter an issue where a spinning pop-up indicator message saying “Verifying update…” appears stuck on the screen. This is a fairly common issue that is somewhat annoying because while the iOS update is verifying, the entire iPhone or iPad is unusable. 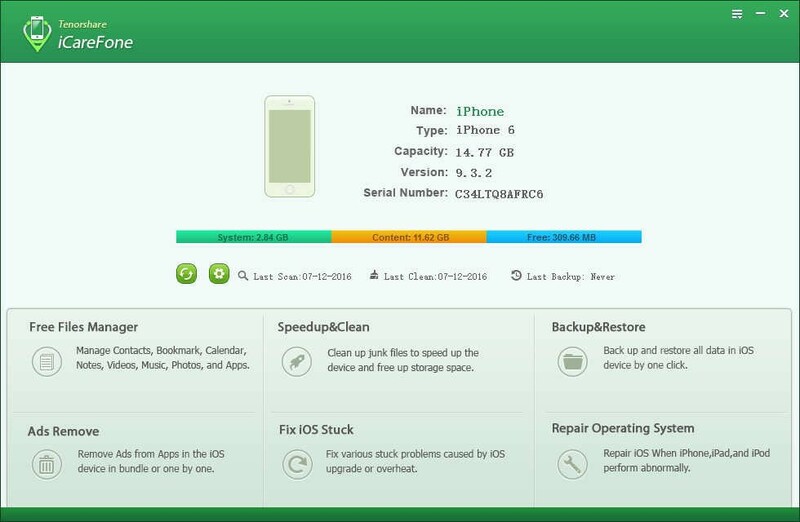 Tenorshare iCareFone is such a professional tool to help us fix all iOS stuck issues in several steps. No matter apple logo, recovery mode stuck, reboot loop, app crash, etc. 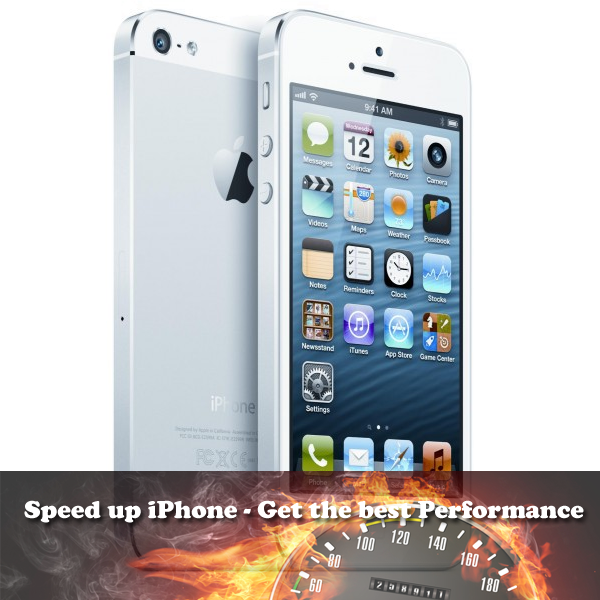 You can use iCareFone to fix those case. Step 1: To connect your iOS devices to PC, launch iCareFone and select “Fix iOS Stuck”. 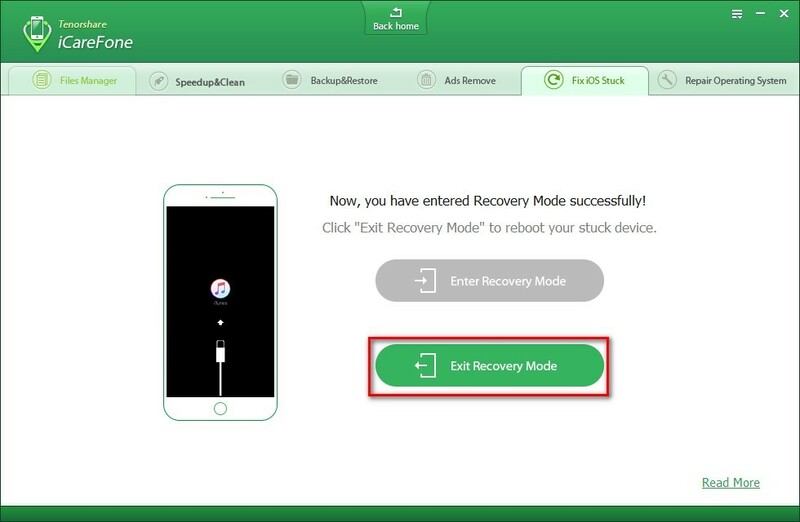 Step 2: After your iPhone is detected by iCareFone, you can click “Enter Recovery Mode” button to put your iOS devices to recovery mode. Then you will see your device display the classic USB to iTunes logo. Step 3: After a few minutes, you start to exit recovery mode. 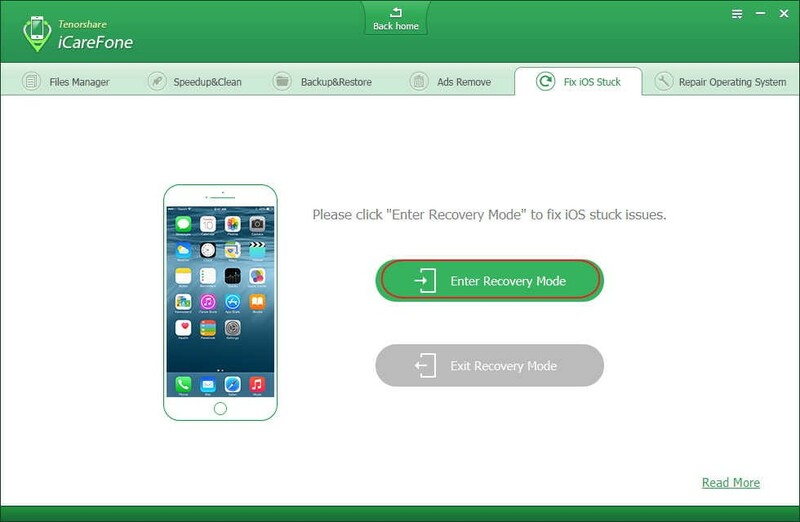 Click “Exit Recovery Button” and wait about 10 seconds for your iPhone boot up from stuck. 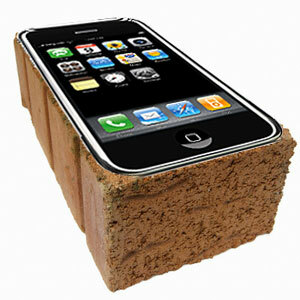 After the rebooting process finished, your iPhone is already out of recovery mode. Tips: If your iOS devices could not be detected by iCareFone. You can choose to enter DFU Mode. When your devices could not be detected by iCareFone, you can try to enter recovery mode manually. If this still does not help, you can enter DFU Mode from iCareFone as below. Step 1: You can choose the three steps to put your iOS devices to DFU Mode as iCareFone shows you. 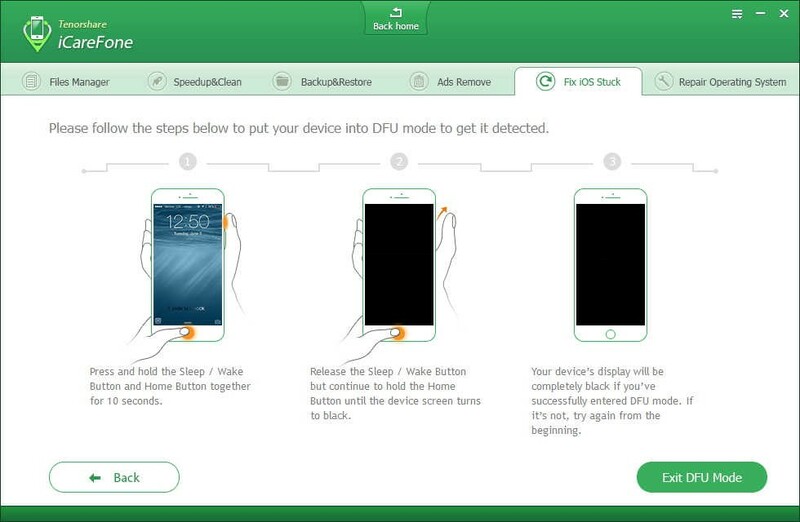 Step 2: When you entered DFU mode successfully, the device’s screen will be black. If not, you can start over and try again. 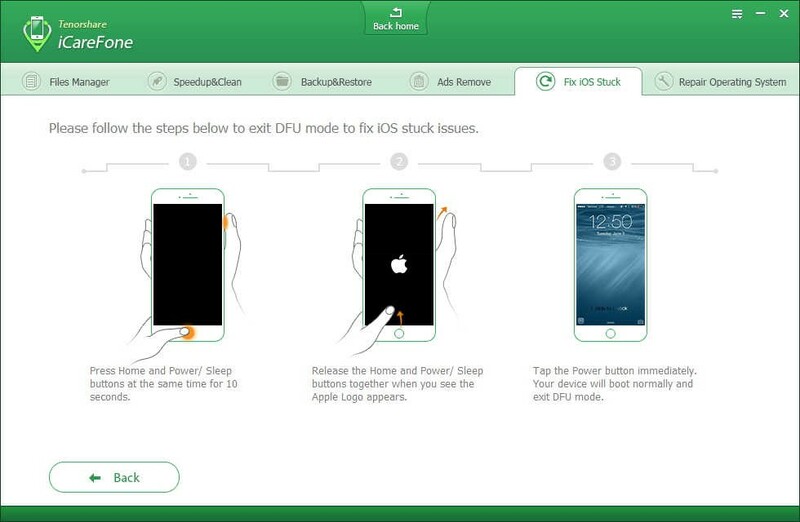 Step 3: Here you can click “Exit DFU Mode” after you have put your iOS devices into DFU mode successfully. Step 4: Then you follow the steps as iCareFone shows to exit your iPhone/iPad/iPod touch out of DFU mode. Finally, you can fix most of all iOS stuck issues from using iCareFone. Step 1: Simply press the power button on the side or top to lock your iDevice. Then wake it again. Step 2: Repeat to lock and wake your iDevice for several times. Step 3: You may need to repeat for 5-10 times. Step 1: Simply hold the “Home” button and “Sleep/Wake” button at the same time. Then you can try this procedure several time. Step 2: Keep holding until the screen turns off and then release buttons once Apple Logo appears. If not, you can try step 1-2 again. Step 3: Once your iPhone has rebooted, go to Settings>General>About and make sure that the iPhone is running on the iOS 10. If not, repeat the update process. Step 1: This is important: Make sure you have a complete backup on computer. Step 2: Launch iTunes and connect your iDevice to computer. Click the iDevice button. Step 3: Click on Summary tab and choose restore iPhone. Choose the backup you need, and click restore. Top 4 methods above to teach you how to fix iOS stuck on “Verifying Update” easily. Having you actually acquired these methods. If there is anything confused you. You can get answers on Tenorshare website.